This guide will help you learn how to set up a WebEx conference on your Samsung Galaxy S5 smartphone. If you haven't yet tried this on your handset and you're keen on giving it a try this time, then you may refer to this guide. In order to use WebEx and make a conference with your friends, the first thing you'll need to do is download the WebEx application both on your phone and your friends' devices. For example, if you want to make a WebEx conference between Galaxy Tab S and your Galaxy S5 or other smartphone. If you're ready to get started, then let's get started right here. 1. If you haven't yet downloaded WebEx on your device, go to the Play Store, search for "WebEx," and finally download the application. 2. Follow the on-screen prompts to complete download and installation of WebEx app on your device. 3. After WebEx is installed on your phone, go to Apps, and then touch the WebEx app icon. Doing so will launch or open the app. 4. To proceed with the next steps, you will need an active Gmail account. If you already have the account, sign up or proceed to register and Create an account. To register, touch the button to Create an account and continue to the next step. 5. The WebEx page will be displayed. Touch the button to "Sign up for free basic account." As the name implies, this option is used for general free account. 6. In the next screen, select your country, and create your account for all required fields. Also, don't forget to type in the security text and agree to the terms and policy to complete the process. 7. Once registration is complete, check your email. You should receive an email from Cisco WebEx for account confirmation and account activation. 8. After confirming and activating your account, sign in using your registered account and password. a. Open the WebEx app and tap Sign in. b. Enter your registered email address and touch Next to proceed. c. Enter your password and touch Sign In. d. Wait until the WebEx screen shows up on your device. 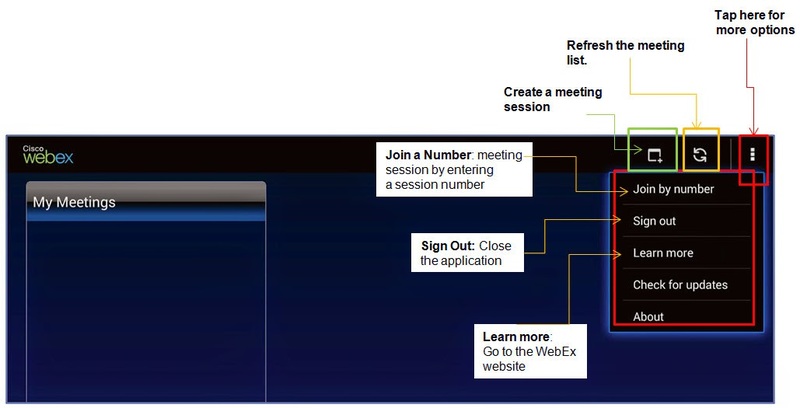 Refer to the image below to learn the basic parts and functions of WebEx app before you begin setting up a meeting or conference. e. When you're ready to start, touch the icon to Create a meeting session. (Refer to the above image). f. A new screen will then prompt. Enter a topic for the meeting you want to set up, set a password and then touch the Start now button to begin. g. Touch the option to Connect using Internet. h. The microphone will now be enabled and shows up at the upper-right corner of the screen, in between the Share screen button and the video icon. You can now set up an audio conference with others. How to Join a Meeting Session on WebEx? You can use any of the following methods to join a meeting. Among the options available are: by session number and from an invitation email . 2. Sign in to your WebEx account. 3. Touch the option to Join by Number. 4. Enter a session number, then touch the button to Join. 5. Touch the icon to Connect using Internet, located on the upper-right of the screen next to the video icon. 6. You should then see the microphone icon will turn on, and will show at the upper-right of the screen. You may now begin setting up an audio conference with others. 1. Open the invitation email you're received. 2. Touch the link in the email to launch WebEx. 3. Wait until the sign in screen appears. 4. Sign in to your WebEx account. 5. Once you're signed in, a meeting screen will then show up on the screen. 6. Touch the button to Connect using Internet. 7. You should then see the microphone button/icon will turn on and shows at the upper-right corner of the screen. 8. You can now start having an audio session or conference with others. WebEx app is often used in businesses, for an easier, quicker and better option for setting up modern business conference sessions. The above procedures are also applicable or can also be used when setting up a WebEx conference or meeting on Samsung Galaxy Tab S.